If you've never heard the term before, it probably sounds a little funny, but spatchcocking just means removing the backbone of the bird so it can lay flat. This allows it to cook much more evenly in about half the time, so you don't have dry, overdone pieces. It also exposes more surface area so you end up with crispier skin. You may be able to get your butcher to do the dirty work for your, but if not, the process is relatively simple. All you need to spatchcock your bird is a paring knife and a pair of poultry shears. 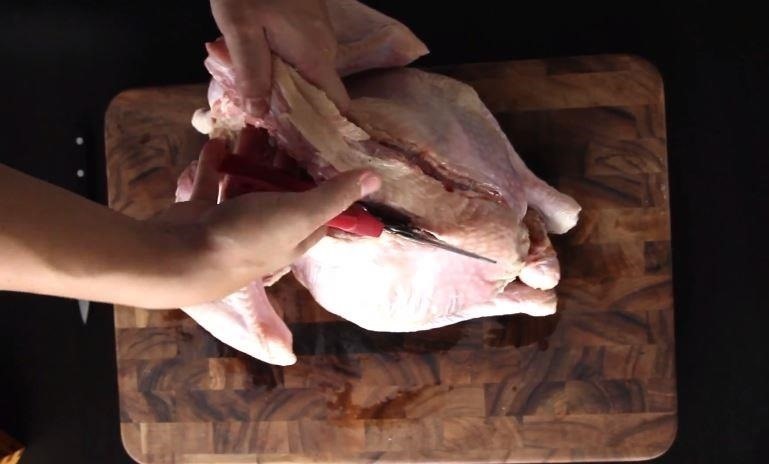 Place the turkey breast-side down and use the shears to cut along each side of the backbone. You'll be cutting through the leg and rib bones, so it might take some elbow grease. Now, trim off the excess fat around the cavity and use your paring knife to cut around the wishbone and pull it out. Once you're finished, flip over your turkey and use your hands to press down on the breast bone and flatten it out. Tuck the wings under the bird and it's ready to go in the roasting pan. Check out the video by J. Kenji Lopez-Alt of Serious Eats to see the process step by step, and for instructions on how to use the backbone to enhance your gravy. You can also head over to his full article on Serious Eats for more details.